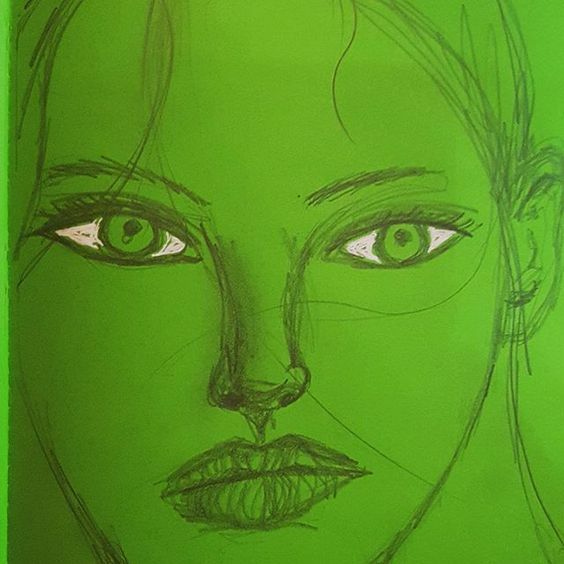 I started drawing faces because it was always something I was afraid of. 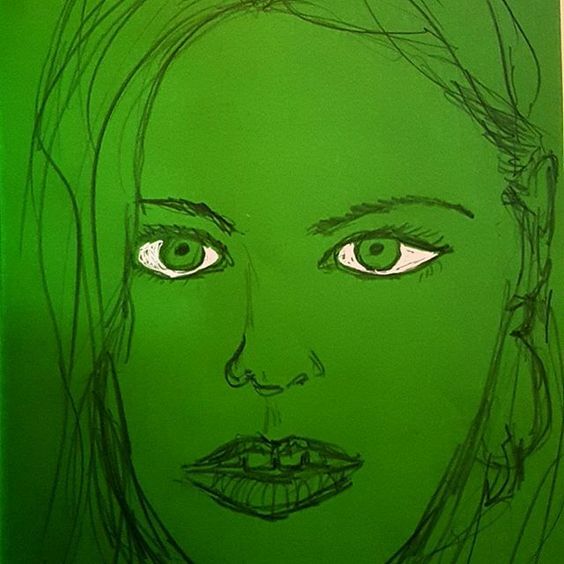 Below you will see a few pre-challenge faces which I drew in my journal with green pages. Then I started the challenge more "seriously" because I wanted to push myself to draw faces. 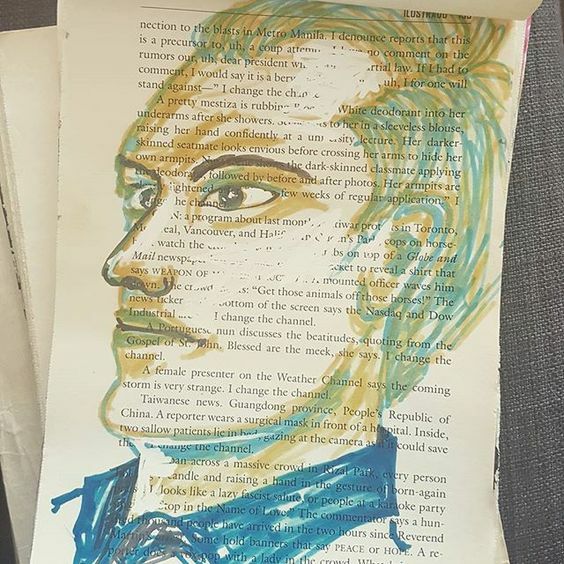 To draw better faces. More interesting faces. I wanted to try out styles and materials and discover preferences and strengths. I ended up doing more than 50 faces! 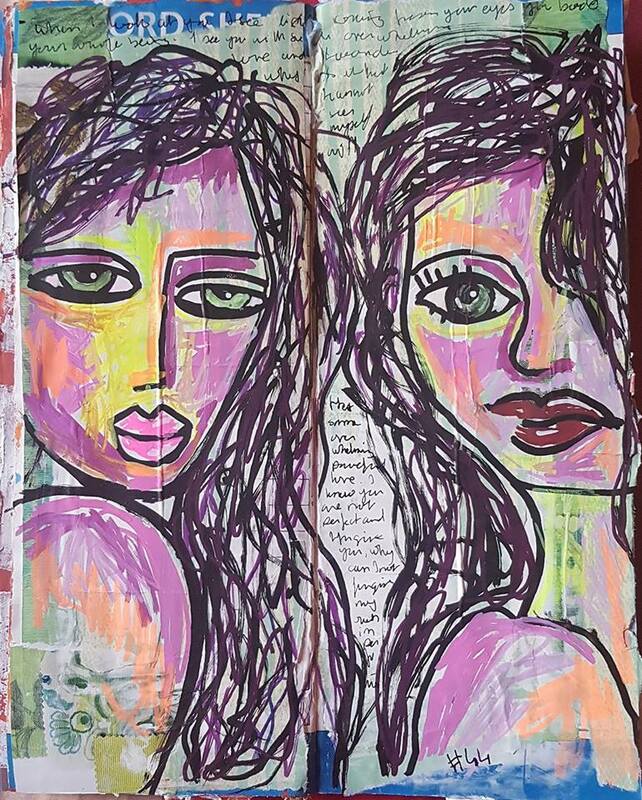 Black pen and watercolour #faces on recycled book as Art Journal. 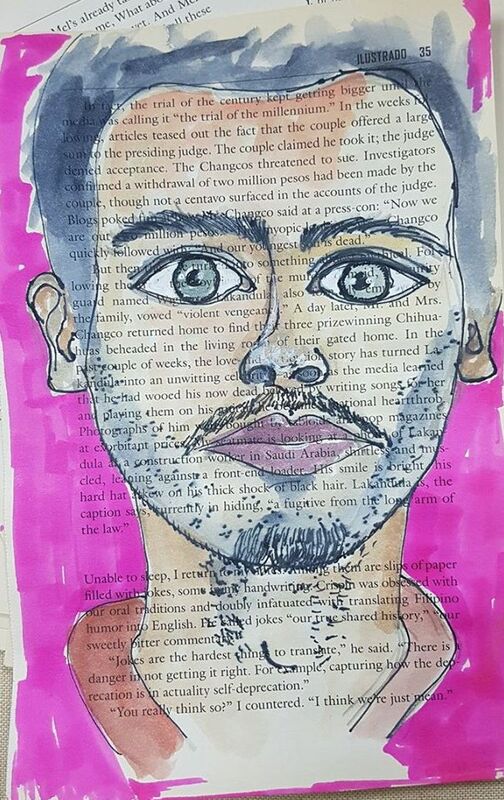 Black pen, markers and watercolour ​#faces on #recycled #book pages. 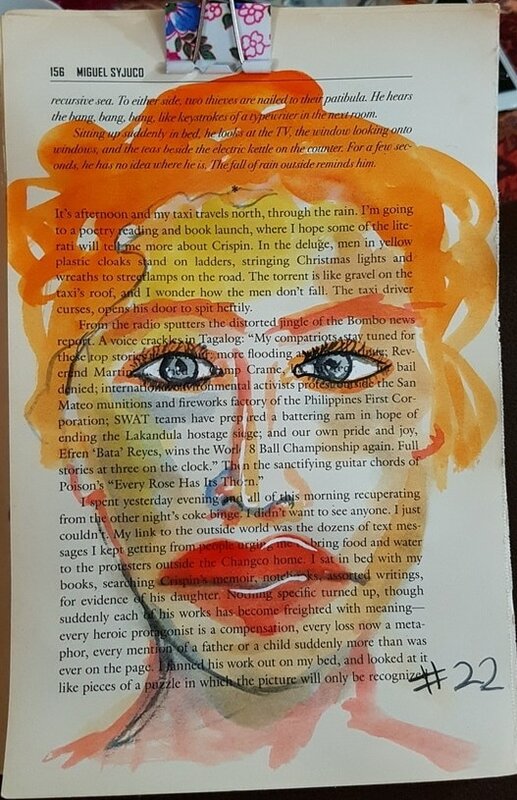 Still with the black pen and watercolour ​#faces on #recycled #book pages. ​Loving the hair and the hat! 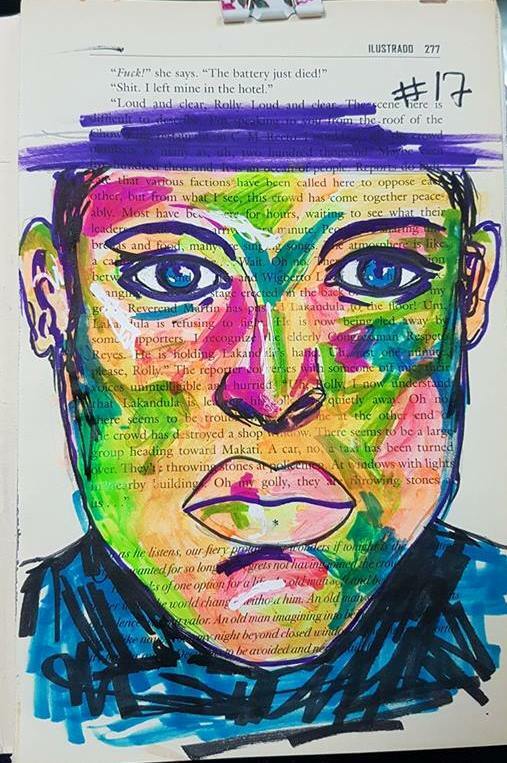 Black Molotow pen and watercolors #faces on #recycled #book pages. 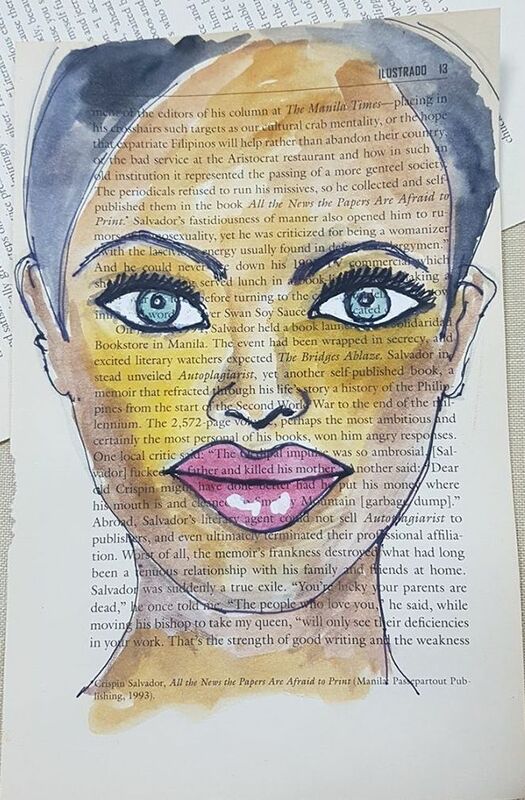 #faces on #recycled #book pages. The plan is to #draw 50 faces. ​Two versions of this face, differently camera lighting. I started with a plain blue ball point, and I added red lines with the red ball point - with the intention of correcting some lines - the end effect looks to me like the way images do which are supposed to be viewed with 3D glasses. I kind of like it. ​Shading with watercolors. I'm using the water brush; it's not bad for quick work that's not too detailed. 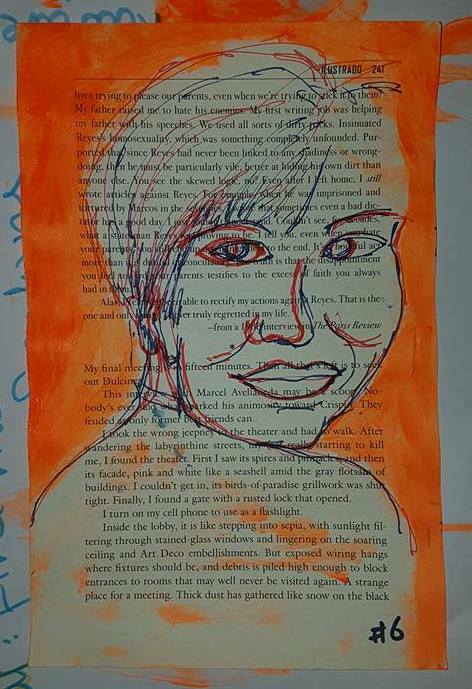 #faces on #recycled #book pages. The plan is to#draw 50 faces. Trying different styles and materials. Watercolors for the background, black Tombow for the drawing, and white corrector ink for the white highlights. 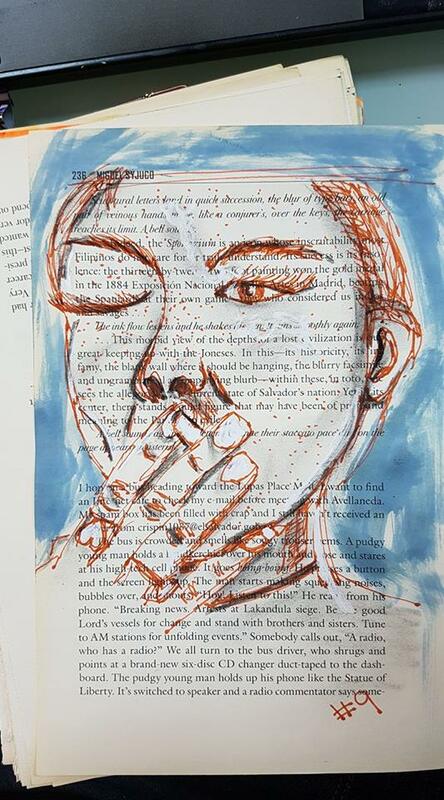 ​Drawn with Lamy pen with orange ink, charcoal, white corrector ink and faded Jean distress ink to frame it all. 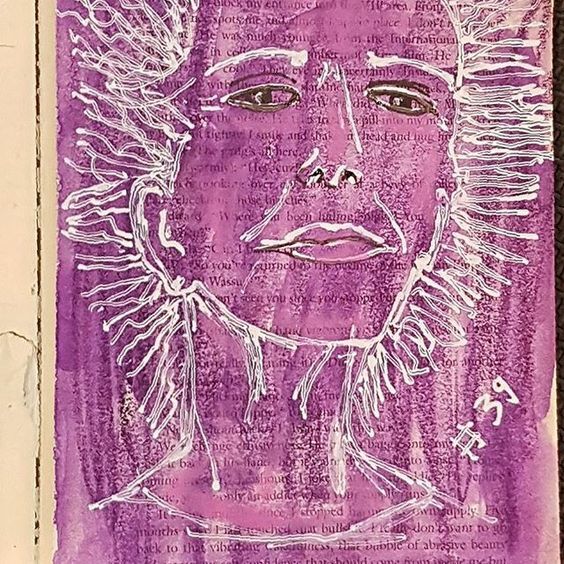 Drawn with Japanese brush pen made in China :), white corrector ink and brushed pewter distress ink on #recycled #book pages. The plan is to #draw 50#faces. 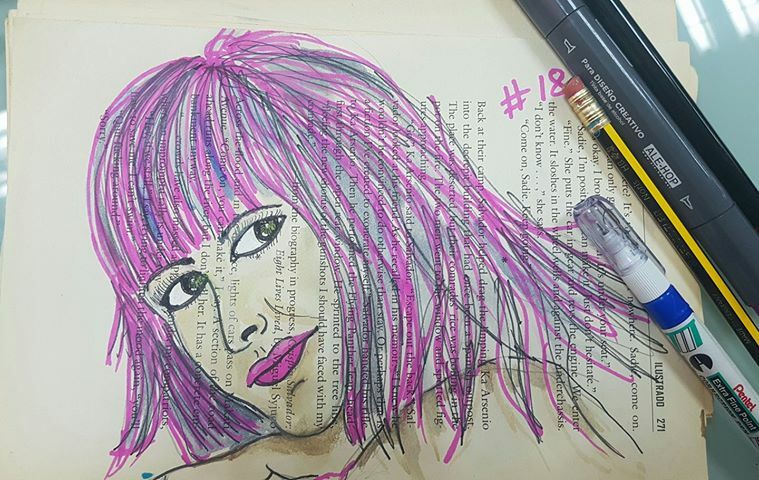 Drawn with Molotow black pen, white corrector ink and watercolors on #recycled #book pages. 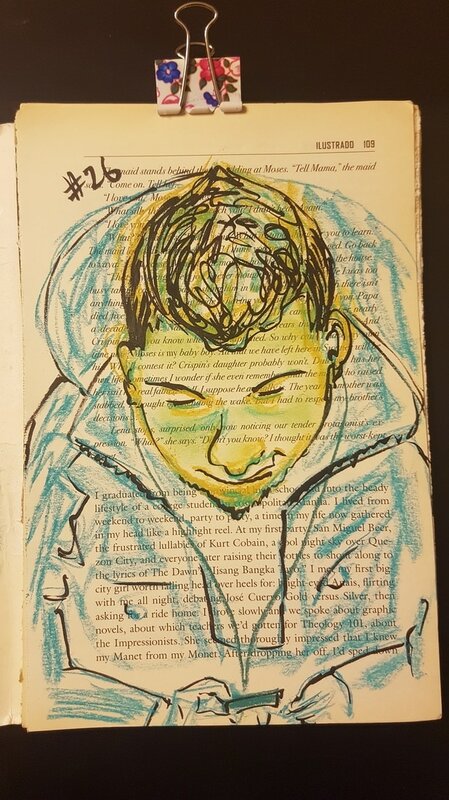 The plan is to #draw 50 #faces. 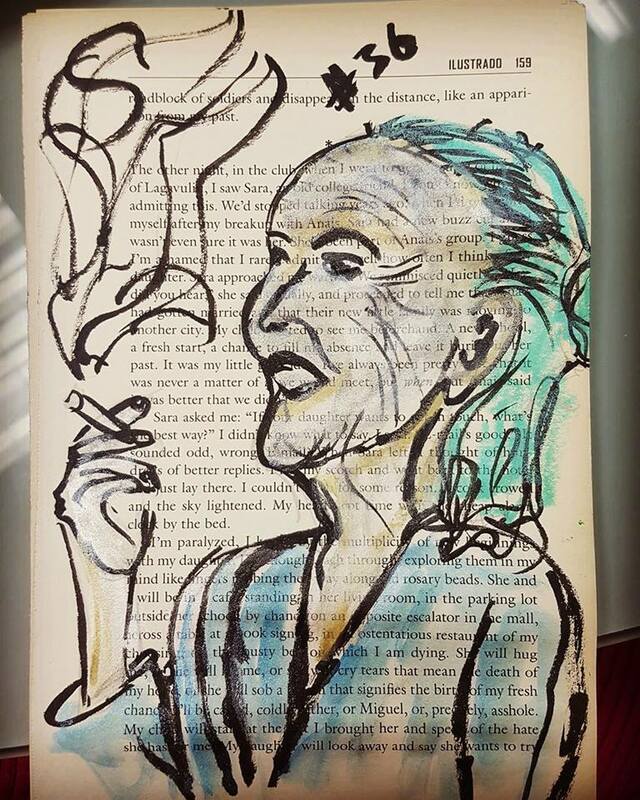 ​Just Molotow black pen on recycled #book #pages. 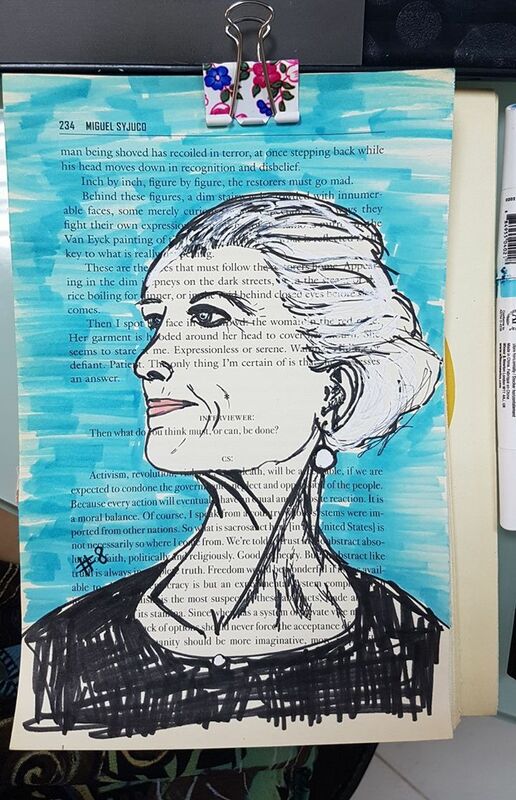 ​Molotow black pen, Derwent pastel pencils, white corrector pen and black brush pen on recycled #book #pages. 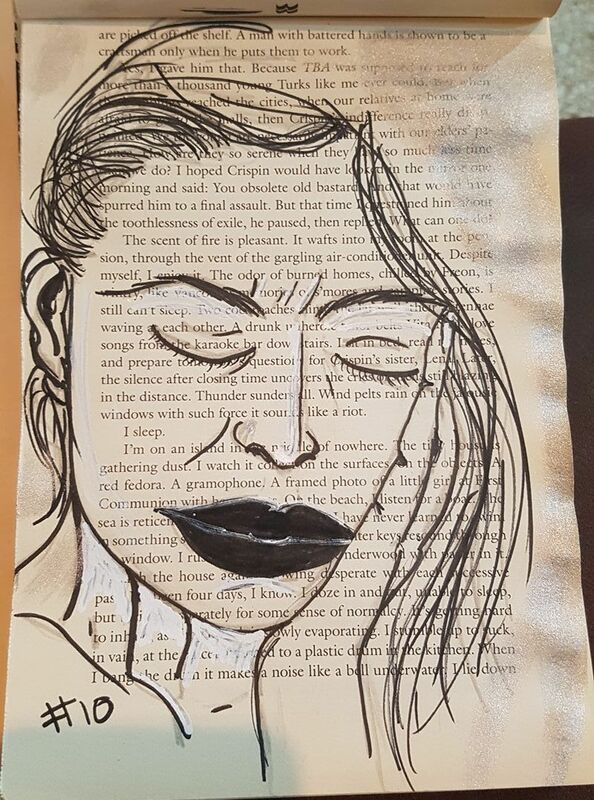 Just black and white charcoal on recycled #book #pages. ​Loving these Gelatos! Like butter on the paper. So much pleasure and sensuousness from a crayon! They should be banned. Faber Castell made them in several colour collections .. metallic, soft juicy shades, gold, silver, black and white. Use them like crayons, smear them and blend with your fingers or sponge. They glide on the paper, and look good enough to eat. Like those strawberry, apple and orange flavoured lip balm sticks I used as a kid. Maybe that's why I love them. 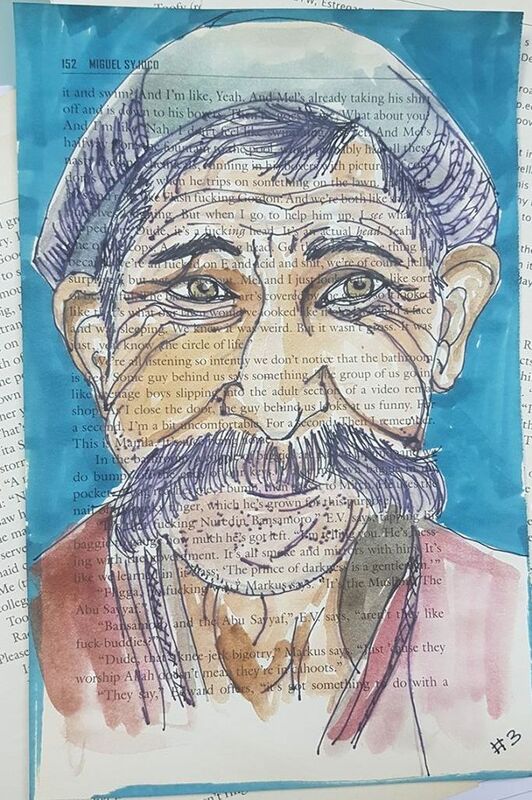 Same as Face #14m but this time using Faber Castell gelatos on recycled #book #pages. ​Did you notice the lips are a bit lopsided? Maybe that's her. Maybe it's me. It hasn't spoiled the image, nor the fun, nor the value of this image being #15. It's life, in all it's glory. Make your mistakes and move on Some you will be forgiven, some not. Can't do anything about that. And you don't need to forgive yourself, either, because there's nothing to forgive in the first place. It's just a drawing for god's sake! 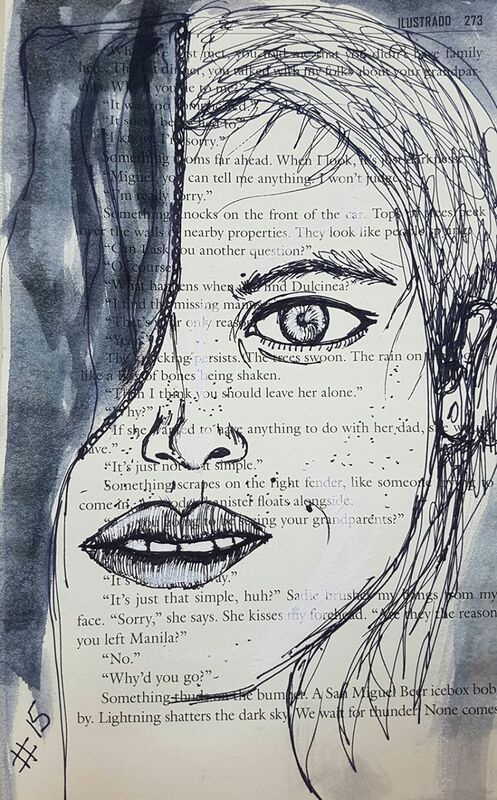 Black roller point pen, white chalk and grey watercolor on recycled #book#pages. 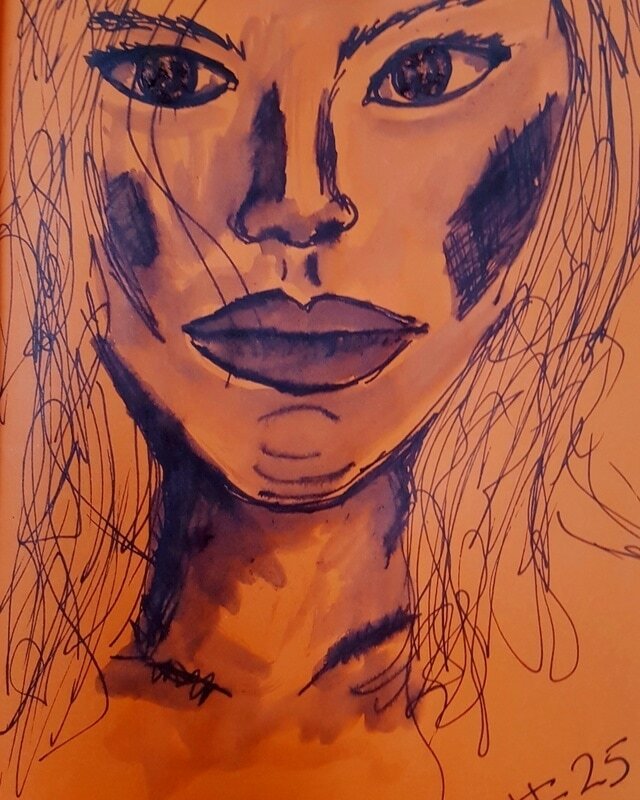 ​Once I started looking at faces to draw, I was surprised at how I turned away from "beautiful" faces .. or, rather "perfect" faces. 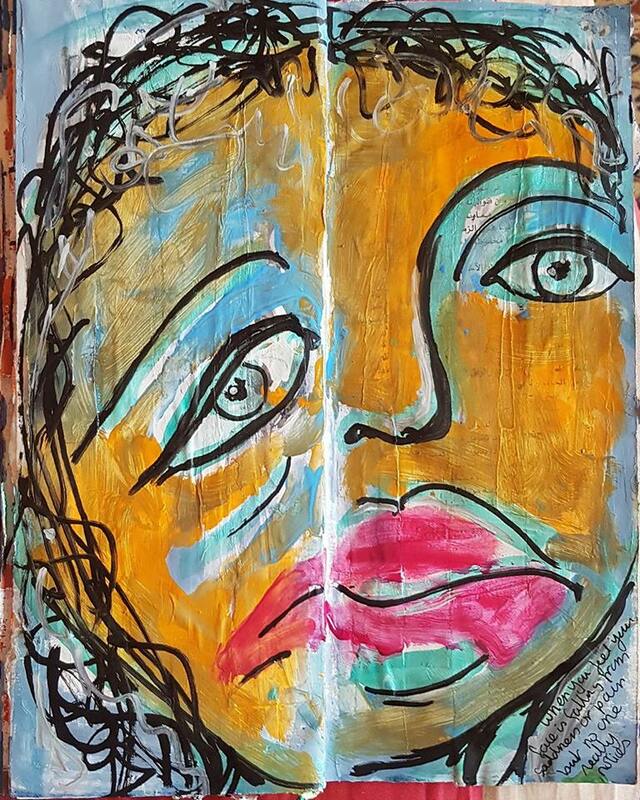 Faces with lines, asymmetrical faces, eyes that have seen a lot, lips that soften or speak of strength. These are the faces that attracted me. AI also looked for a challenge. That's the point after all. And I promised myself to post every face, regardless of what I thought of the end product. 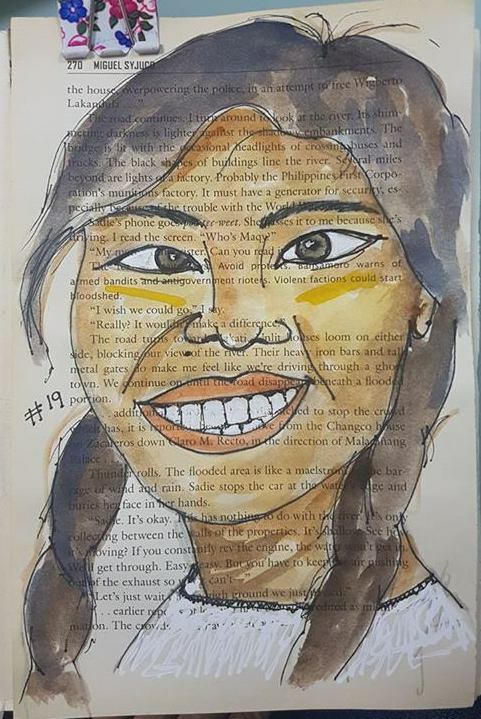 For this face, I first painted the page with watercolor, then drew with black charcoal, white chalk, white corrector ink in the eyes on recycled #book #pages. Tip: When I sprayed the fixative to keep the charcoal and chalk in place, the white faded away into the page. I had to retouch with white Gesso. 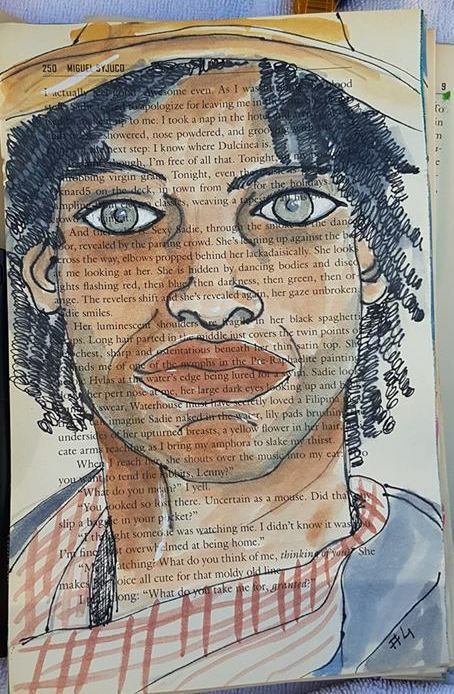 I was drawing this while listening to "On Writing" read by Stephen King himself.  I was thinking how much writing, reading and arting are like life. Are life. For me and maybe for you. "Do you do it for the money, honey? Don't now and never did. Never set a single word in paper with the thought of being paid for it.... if you can do it for joy, you can do it forever." 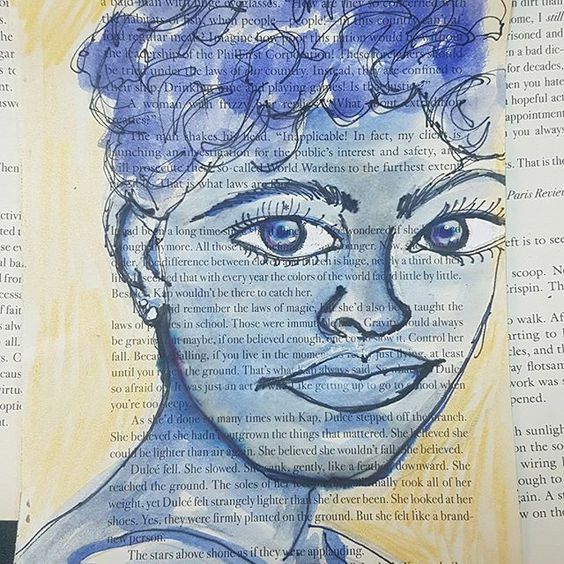 I outlined the face and other shapes with pencil, then I used Daley Rowney neon acrylics, Sharpie brush pens, and white corrector ink on the face and in the eyes on recycled #book #pages. Not words I like. But. I did promise myself to create 50 faces and I'm already on face 18. I tricked myself into consistency and repetition by constantly changing the materials I use. The style I try. The faces I attempt. By making it about Play! Play? Yes, I can do play every day. 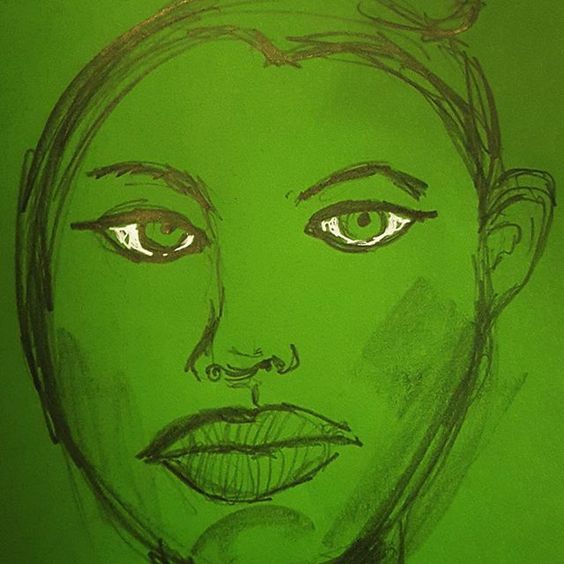 I outlined the face and other shapes with pencil, then I used markers i got from Ale-Hop in Spain last month. 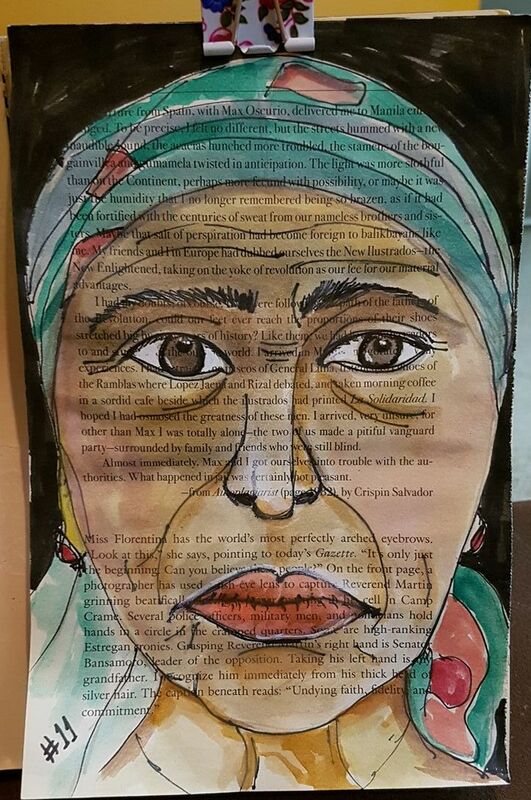 Watercolors and white corrector ink in the eyes on recycled #book #pages. ​I can see a zillion things I could have done better here. It seems I find it easier to draw a face looking straight ahead and mouths glued shut! Ha. But I'm posting this anyway. How do you feel about posting or showing work you're not #happy with? Is it a good idea? Perhaps people would see you as a fraud? Amateur? Perhaps people would see you as imperfect and human, fallible, still learning? 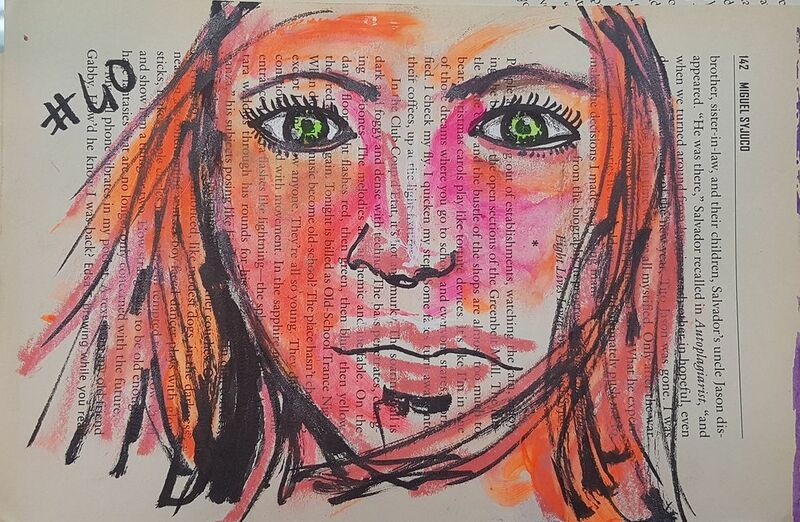 Watercolors and black #Molotow pen and white corrector ink in the eyes on #recycled #book #pages. 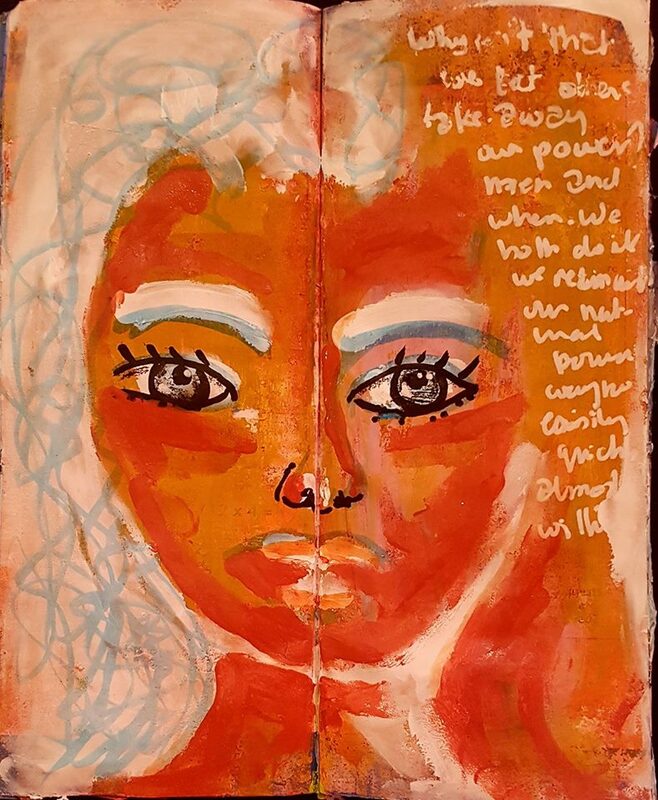 ​Watered down acrylics in neon pink on orange paper.. a very impulsive brush in hand.. I needed to see what it might look like. 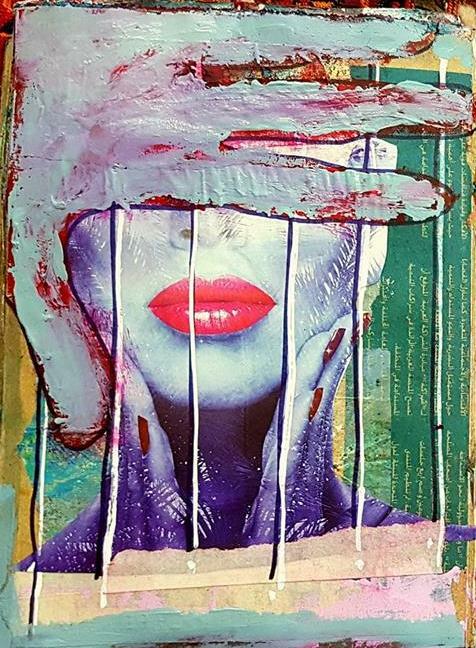 Time to break away and create something a little more abstract. I've never had a fear of the blank page because they are there waiting for me to spill out "stuff" from my pen or brush. ​Blank pages don't exist without my spillings. Or yours. A page's blankness has no meaning. No power. No emotion. No life. You are not ruining anything because there's nothing to ruin. I usually have my art bag with me. A few art supplies everywhere I go. I wanted to create today's face more freely. No predrawn lines. Some detailed work for the eyes, nose, beard, wrinkles. 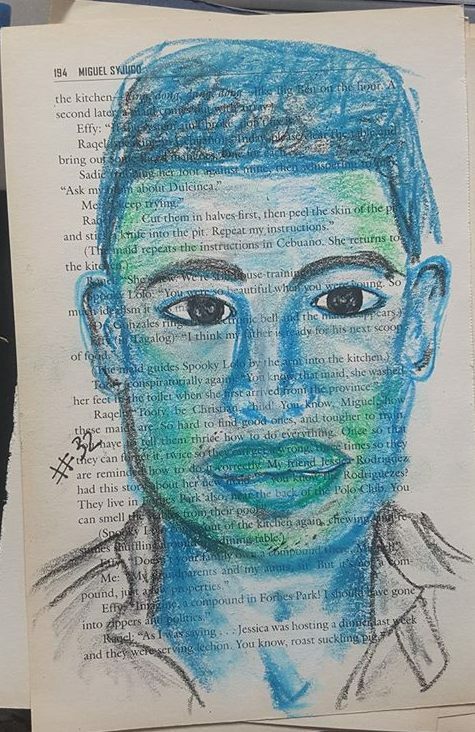 I mixed the orange with both the greens for the face. A little less greens for the shirt. 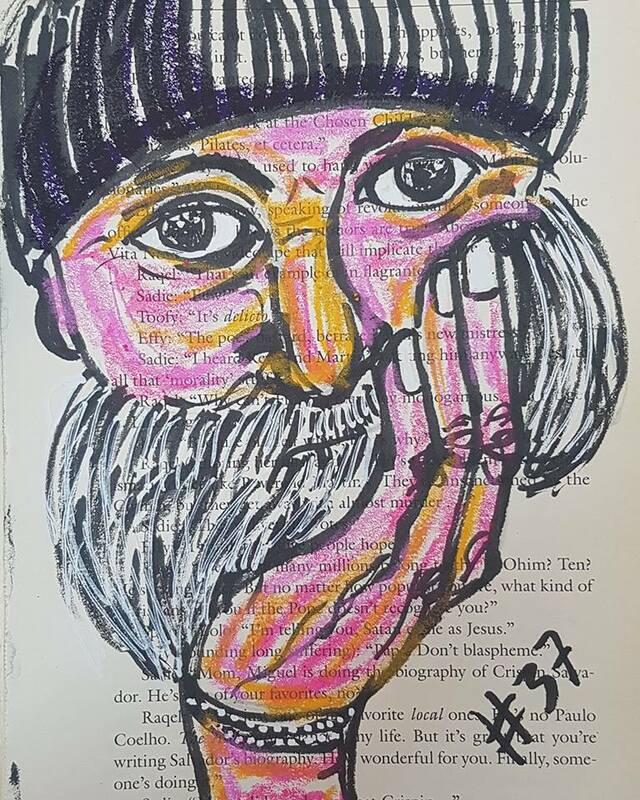 I added white in the eyes and for the beard. 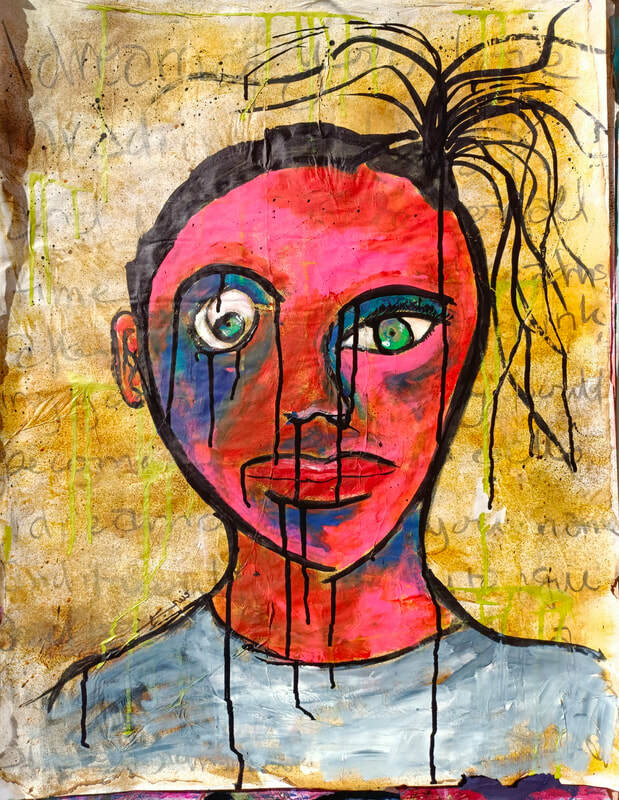 A few black lines around the eyes. I think next time I would (1) Have less paint in the pill box, (2) Bring another tin cover to mix paints, and (3) I'd bring some tissue paper! Moving away from reality slowly. Looking for a style that's more free, loose, and my own. 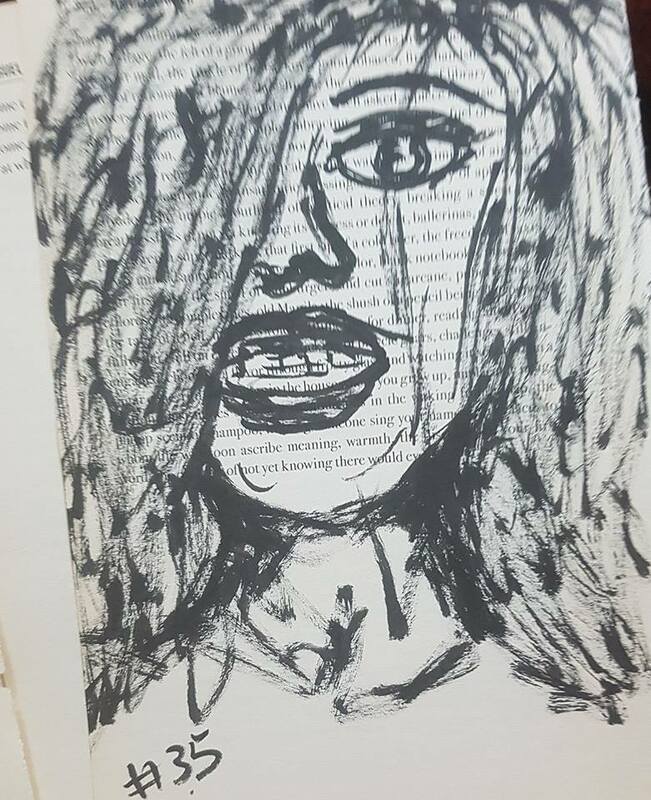 I was so afraid of drawing faces, so I pushed myself into the deep end. Fifty faces is my challenge. Posting them all. Good and bad and everything in between. It's liberating. This jumping in deep end. Water in the nose, a little coughing, stinging eyes. But so what? I will float once I stop splashing around. I choose a new palette of watercolors this time. Oranges, yellows, reds. Cobalt for the eyes and of course the white corrector ink. Indigo for some line work. ​On the plane. On #recycled #novel #pages. 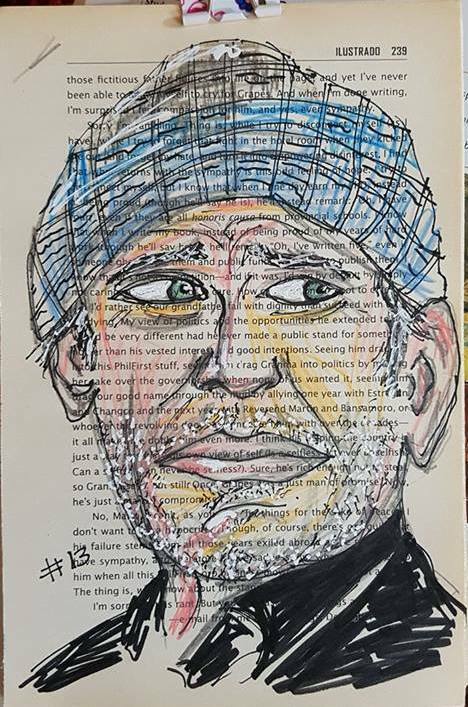 I only used markers #Windsor and Newton markers in phthalo turquoise, warm grey, and yellow gold, and white corrector ink. 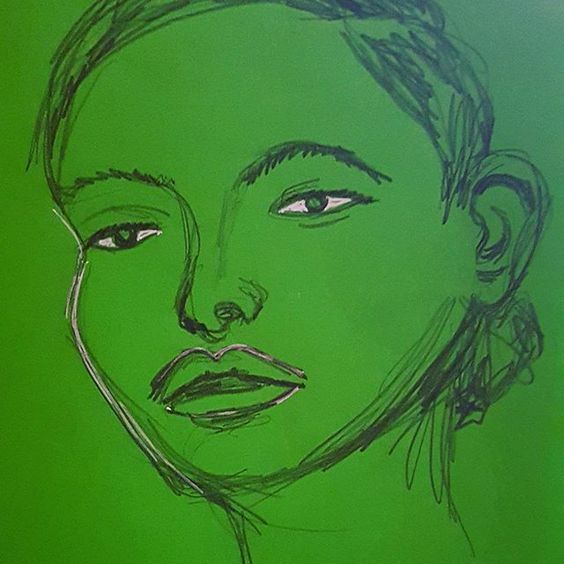 I think the fact that I said I'm going to create 50 faces as opposed to I'm going to #draw one face a day actually helped me stick to my #goal. It's funny how tricking my brain, even as I know I am tricking my brain (or maybe because I know), actually helps. 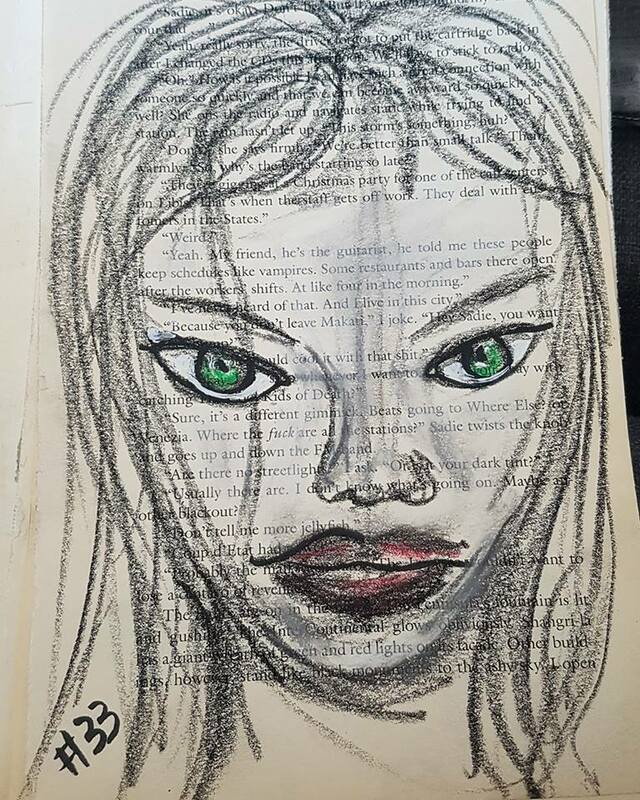 My plan is to draw 50 faces on recycled novel pages. I've made it to 25. 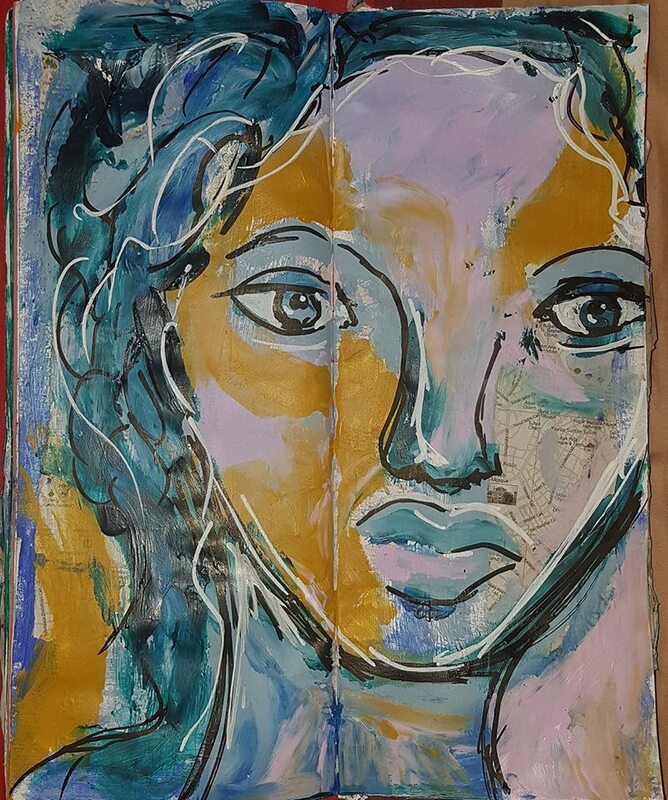 As I didn't say one face every day, I have been able to stick to it whilst also doing other stuff. My mind rejects strict commitments and rebels against me all the time. So I finally decided to work with it not against it. I took a photo of this young man on the subway. 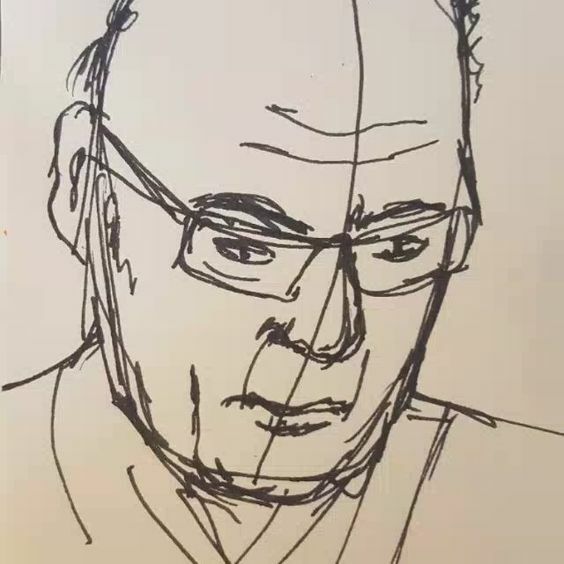 I drew him much later, sitting on a couch and feeling warm. 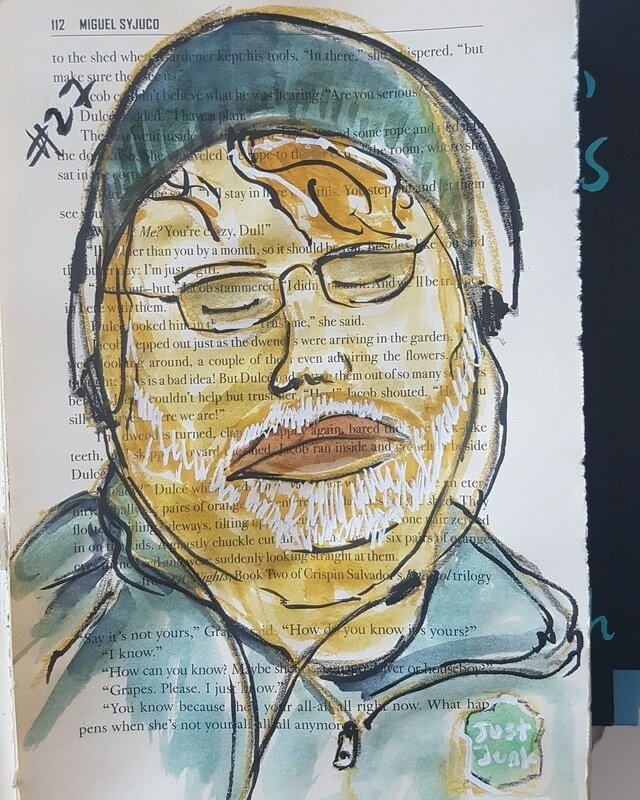 I used #prismacolor #nupastel in #beechgreen to outline the face, hair and jacket. I added lines with #bleupaon and #turquoiseblue. No pencil sketch to start with. I then used my #pental pocket brush pen to add the lines. I had all the pens in my bag. I just bought them from #Currys in downtown Toronto. But I could not take everything out and draw him there and then. Perhaps for subway sketching I need less materials and more confidence. Maybe one day, within this set of 50 faces, I will manage to do that. Just not yet. Pastels, black brush pen, white corrector ink and watercolours. Sleeping on the subway. I wonder what he was listening to? Or maybe just drowning out the exterior sounds. I have to wear layers and layers to stay warm, fishing around my pockets trying to find the teeny weeny token with thickly gloved hands so I can pay for the train or street car ride. Scarf around my mouth and nose or else my nose and my eyes will be leaking endlessly. Coming to Toronto reminded me of what it's like to commute everyday on public transport in the freezing cold to go to work. I did this about half an hour after i woke up. In bed. My sketch book and some kind of pen always with me. I'm spending the weekend with one of my two sons - I'm alternating between them.. missing them both So much and So happy to be here. 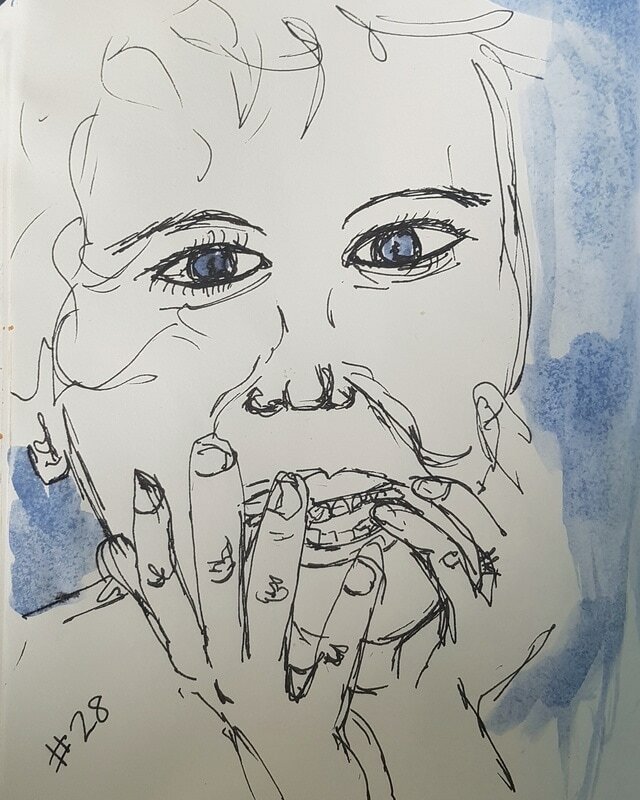 So, anyway, a very quick 5 minute sketch using #FaberCastell fountain pen with black ink and then adding a few touches of blue watercolour. Not sure hoe i feel about this one, but I did make a commitment to myself to post all 50 faces I create no matter what. It's part of the process of learning and letting go of perfection. 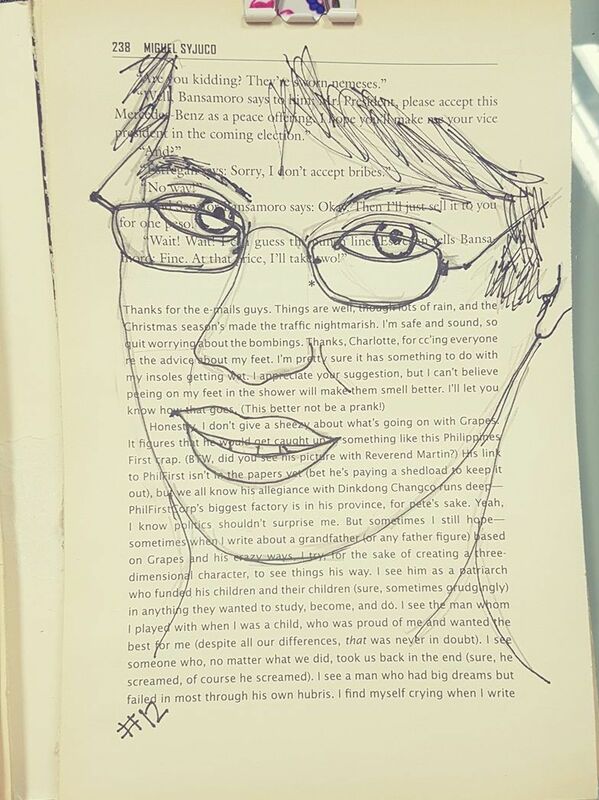 I keep forgetting to take my recycled novel with me when I change places so I can draw my faces on its pages. 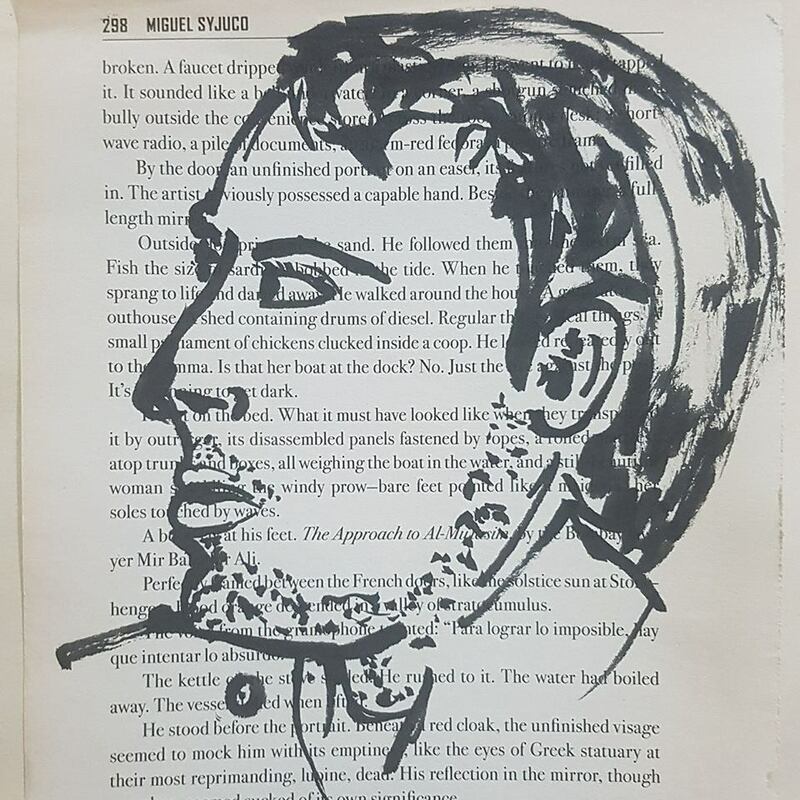 A simple fountain pen sketch following the face contours of a found image. I'm now thinking I like the pen drawings and the gelato faces the most. As I left my gelatos in #Dubai, I'm going to continue with pen and ink and some watercolours for now. Yay! I'm so loving this whole challenge. I'm so impressed that I got to 30 out of 50, that someone who doesn't like repetition and commitment. 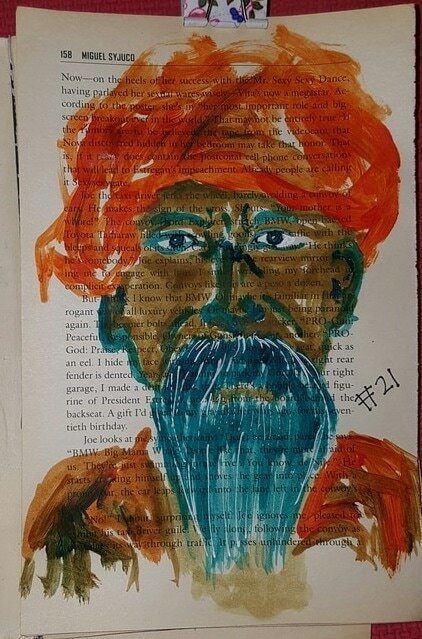 I used my new pental brush pen which I found at #Currys and watercolours by Van Gogh. 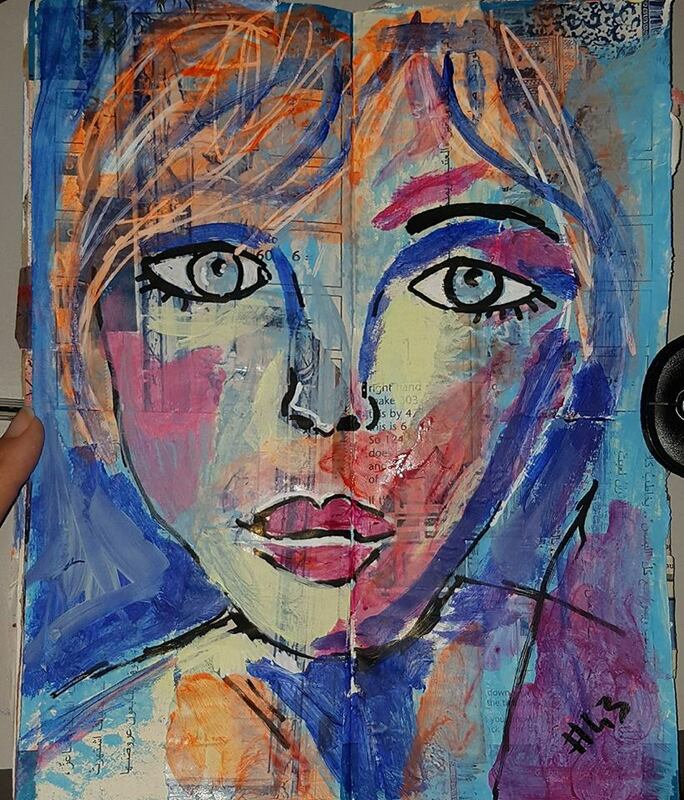 The face is purely imagination and whimsy, girlie style. The process of repeating and trying and using various materials and of creating regularly. Common sense and logic and works for everything. Tim Hortens at St. Claire. My son was my accomplice as he took his picture discreetly for me and drew it later. I kept it simple, using my Pental brush pen, nothing else. I did a few different renderings as I struggled to get his facial proportions right as he is not looking straight up and ahead. I think I need to spend more time here.. working on the angles, making things look right. I love wonky sketches, but even they get the perspective right while remaining quirky and interesting. On another note, something about Toronto in the winter makes me feel people are sad, lonely, hurting. The mother in me wants to hug everyone who has a sad face... hug them with every fiber in my being, as if my hugs could cure the world's pain. 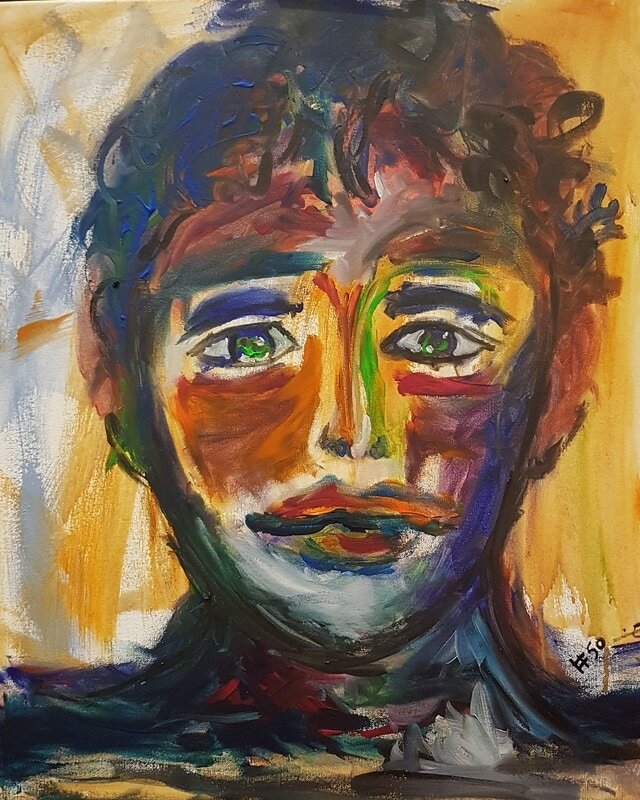 Oil pastels this time. A beautiful face from the net. 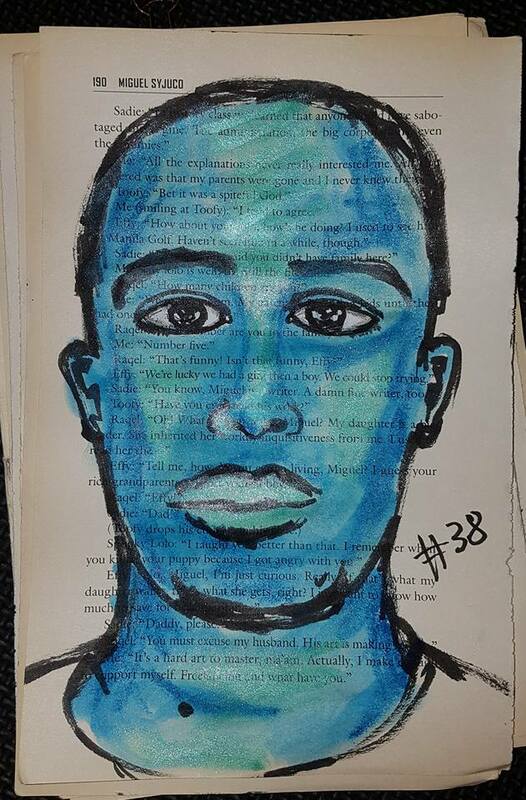 I used four different blues, green, black, silver pastels And white corrector ink and black fountain pen. 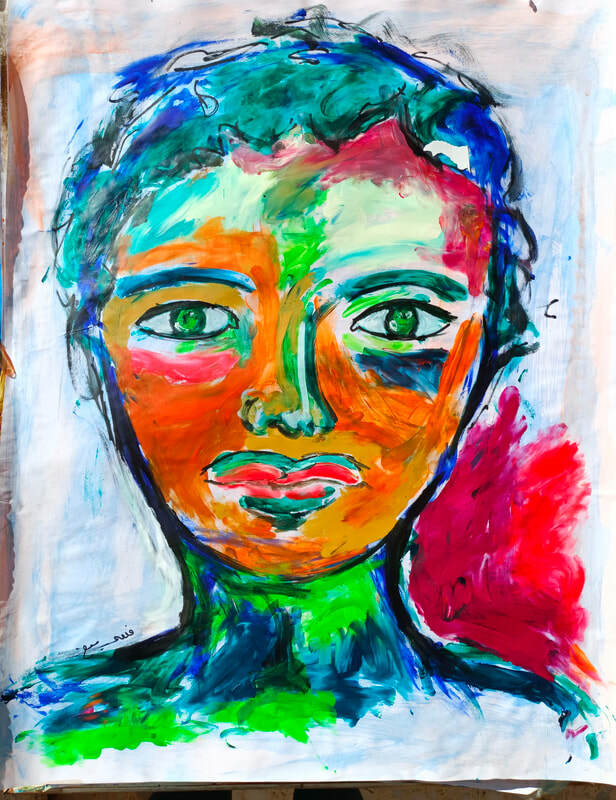 Oil pastels are great. So soft, They glide across the page and blend and soften with you fingers. For exsmple i used blue snd black and silver for the hair and i smudged the colours into each othrt. On the fave, too, i used blues and greens and white. Try playing with them a little, on scrap paper, just to get the feel for them, before you use them on your art. Sunny day in #Toronto. I leave tomorrow. So happy to have spent this precious time with my boys. And to get to know the specisl people in their lives. Black. Green. Red. White corrector ink. I think faces are gonna be a thing for me for a while! I drew in the perspective lines as she is looking down slightly. Tried to blend them in but not very successfully. I should have used pencil and erased it. Still, I do like the result. 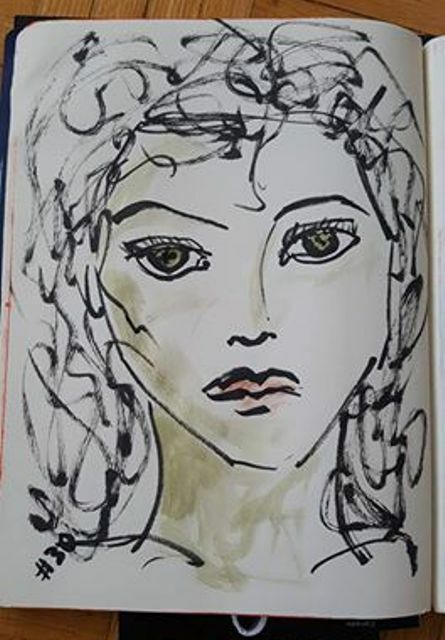 5 minute sketch using pencil then #FaberCastell#gelato pens and finally brush pen. I used silver and metallic blue to give her skin transparency and that delicate feeling. Like she's just a soul with a thin layer of body. How our perspective changes over the years. How everything is perspective. Why are we so afraid of wrinkles? Black brush pen to outline the contours and flick in the whiskers. I added white corrector ink inside the whiskers, too, and for the whites of the eyes and the nails. I used #fabercastell #gelato pens for the shading in lavender, mango and bubble gum. Finally, for the hat I used grape. At the gym. My workouts are usually much shorter than my husband's. So, guess what's always in my gym bag? Pental brush pen with black ink and #gelatos from #FaberCastell. I'm really loving the effect of the gelatos. Not quite pastels or crayons, they glide like butter and are water soluble, so I can blend the colors with a water brush. 12 more faces to go! Well... he's still working out! 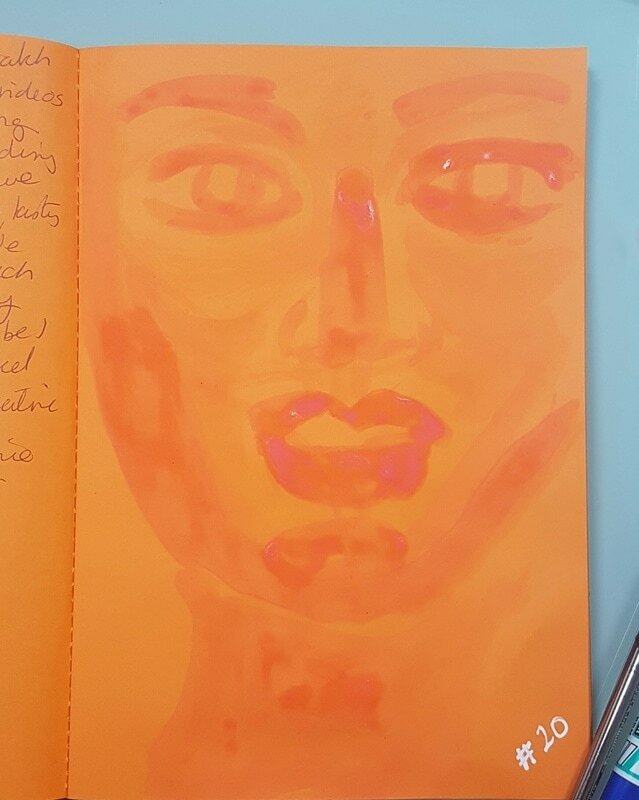 So this time I coloured the full page with grape #gelato which I blended with a brush, then I drew the face with white corrector ink and some black around the eyes and lips. A touch of bubble gum gelato for face highlighting. Yay! I made it to 40 if 50. Neon #Molotow pens in orange, pink and black. 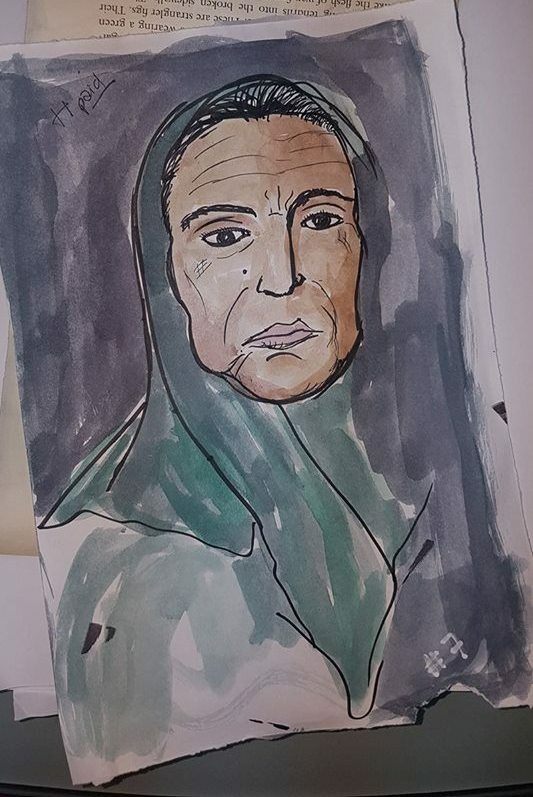 So I drew this on that rectangular insert that came with the circulation socks that that were given to me at hospital this morning when I did left eye cataract operation. 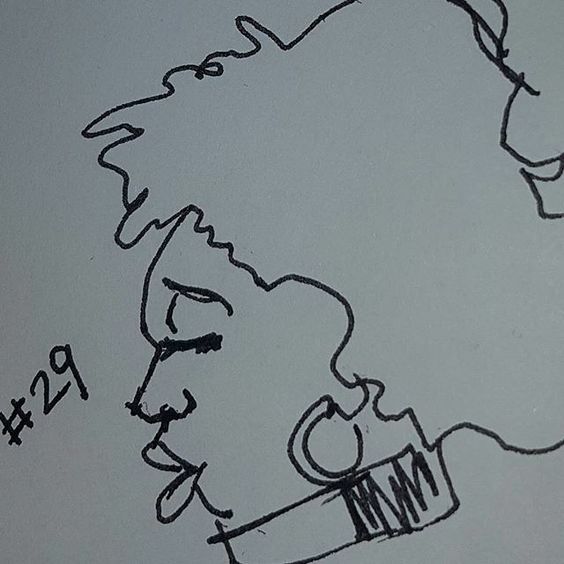 Put on the socks, drew the face, homage to left eye. Nothing goes to waste .. lol. Operation went well and I'm home now. 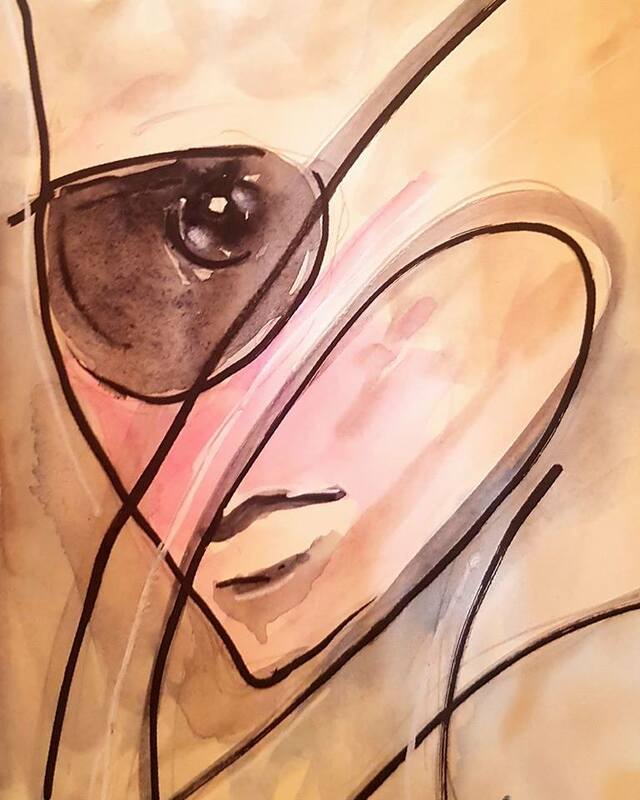 Probably influenced by my eye surgery :) Pencil first for the overall outline, I then added the watercolours .. charcoal, turquoise and deep red, I outlined with #molotow black and white in the eye while paint was still wet. 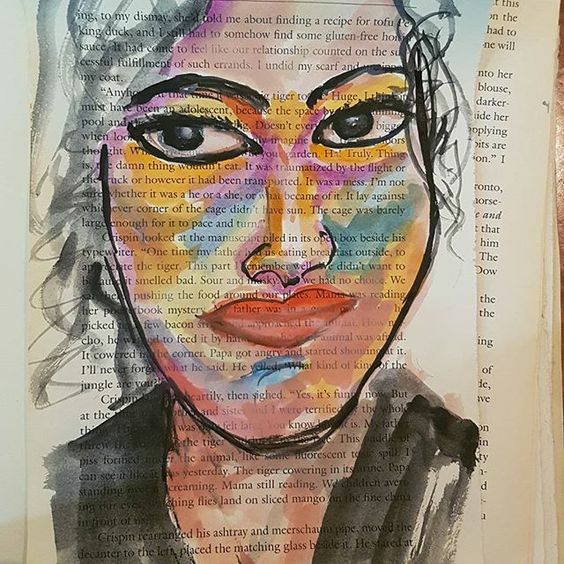 I drew this in my art journal as inspiration struck and I wanted to paint it there and then, so i didn't get up to get my #recycled #novel #pages. So a friend gave me an asthmatics workbook that is about 20cm by 30cm which I promptly gessoed and collaged over to create interesting textures and backgrounds. And I decided to fill it's pages with faces. 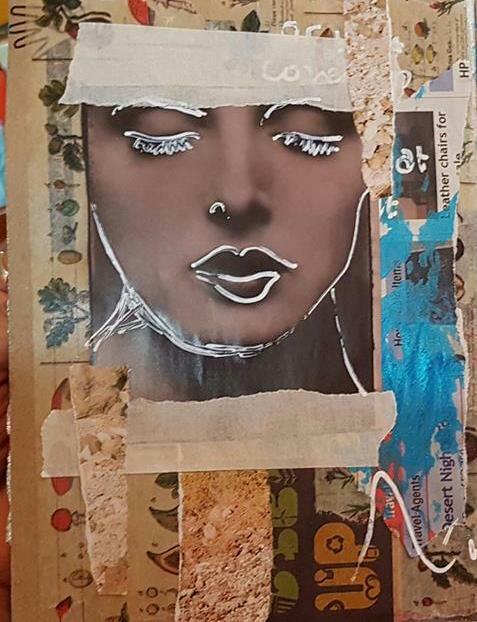 For the background I used newspaper strips and various images from magazines, and gesso and acrylics. 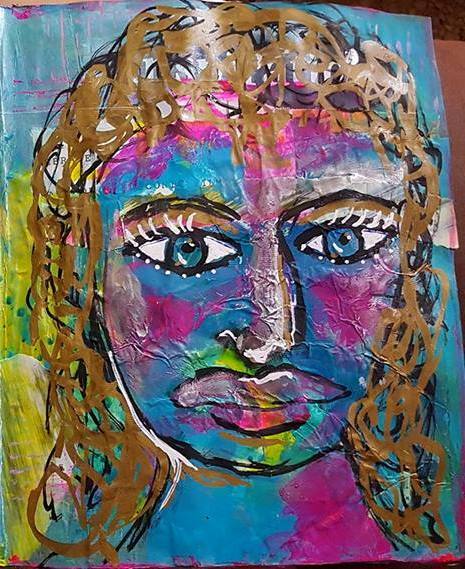 For the face I used #molotow markers and acrylics. Face inspired by online images. It looks like I may end up doing more than 50 faces! I know I have two faces here, but she is talking to her other self. Her other self is not her twin in any way. "When I look at you I see a light shining from your eyes, your face, your whole being. Why can I not look at myself with that same overwhelming powerful Love? I feel your faults and I forgive them. Why can I not forgive mine?" 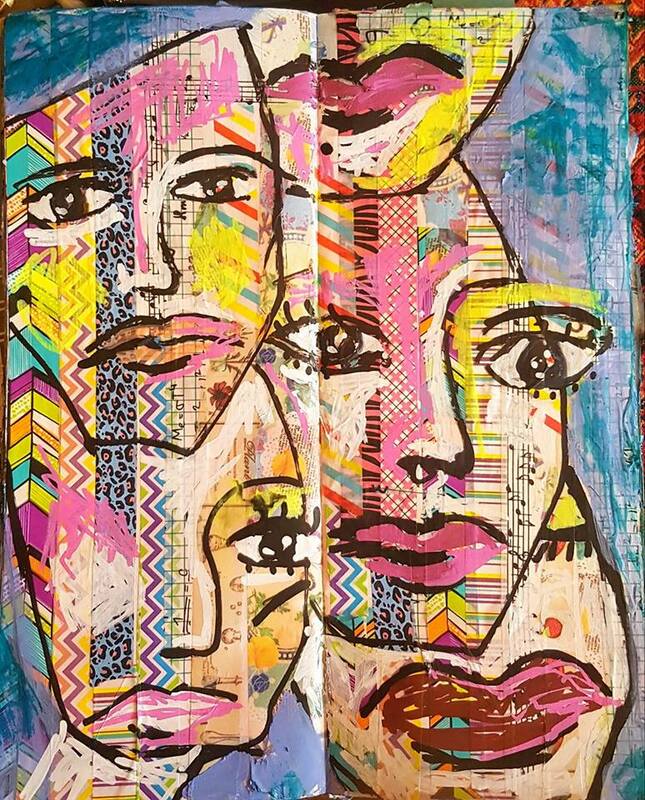 I created these faces using #molotow markers drawn over gessoed and collaged pages of a recycled maths workbook. I used paper carrier bags for the collage this time. I painted on the acrylics with my fingers. Four colours only. 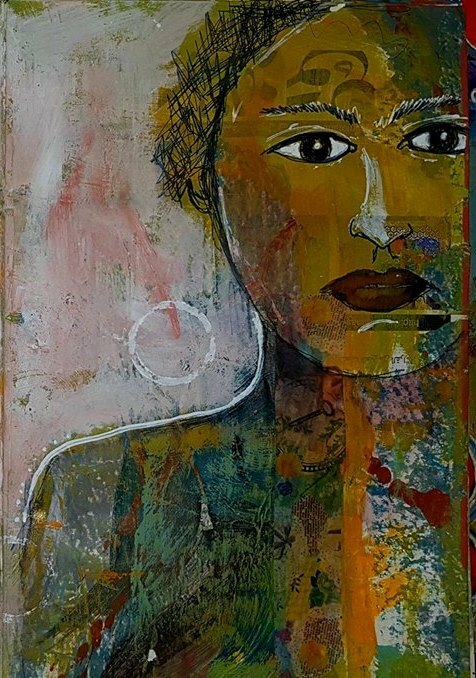 The background was heavily and darkly collaged with magazine images and layered to give a rich texture. 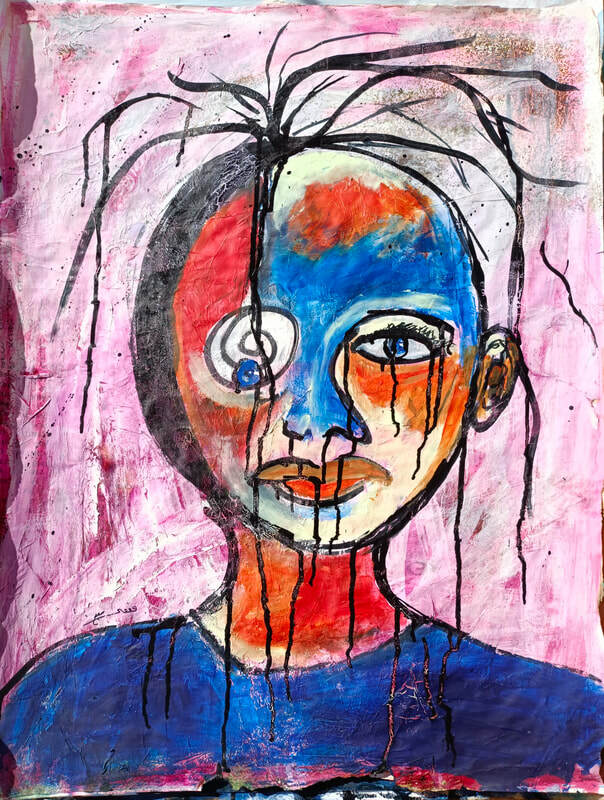 I had this face of a child in my mind and my fingers just took over and painted it in. I did use my black#molotow marker for some outlining and definition. 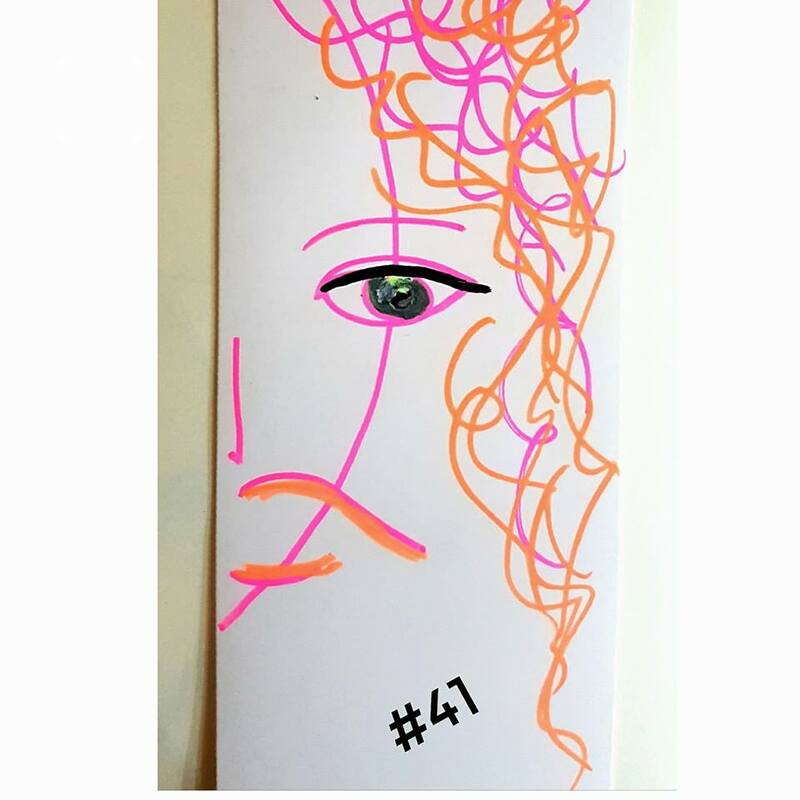 Face was created in that same maths workbook I'm currently recycling as art journal for these faces. 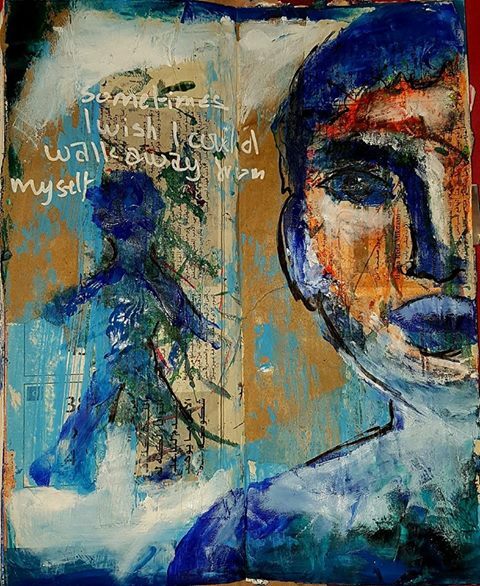 ​"Sometimes I wish I could walk away from myself." You know. You say something. You're feeling very emotional. You blurt it out. Then you feel like such a fool. Does this count as Face #46 of 50 faces challenge? 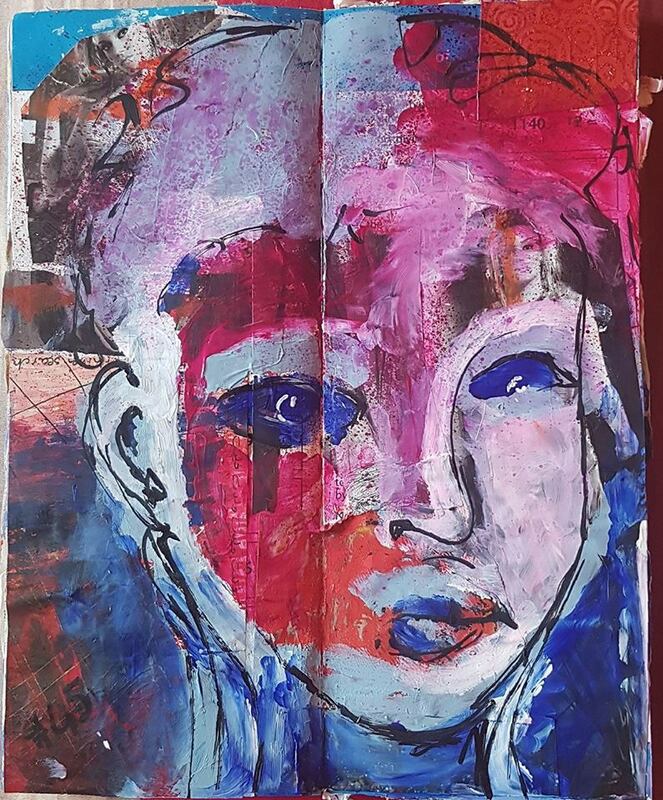 I painted the face in acrylics with my fingers over gessoed and collaged pages of the same maths workbook I'm currently recycling. Still working in the #recycled and #repurposed maths workbook. I'm using my fingers again to paint with acrylics on gessoed and collaged pages. There's a sense of freedom and lightness when I use my fingers. I know what face I want to draw but not completely. There's still the element of surprise which comes from the way acrylics will spread on the page. I really love that. 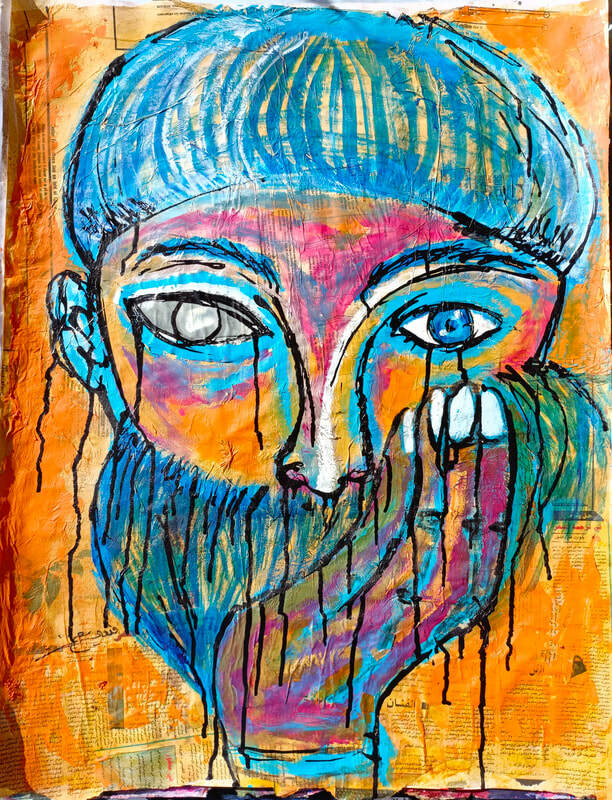 "When you feel your face is falling from sadness or pain but no one notices"
Ink and acrylics and #molotow pens on gessoed and collaged pages of the same maths workbook I'm currently recycling as art journal. 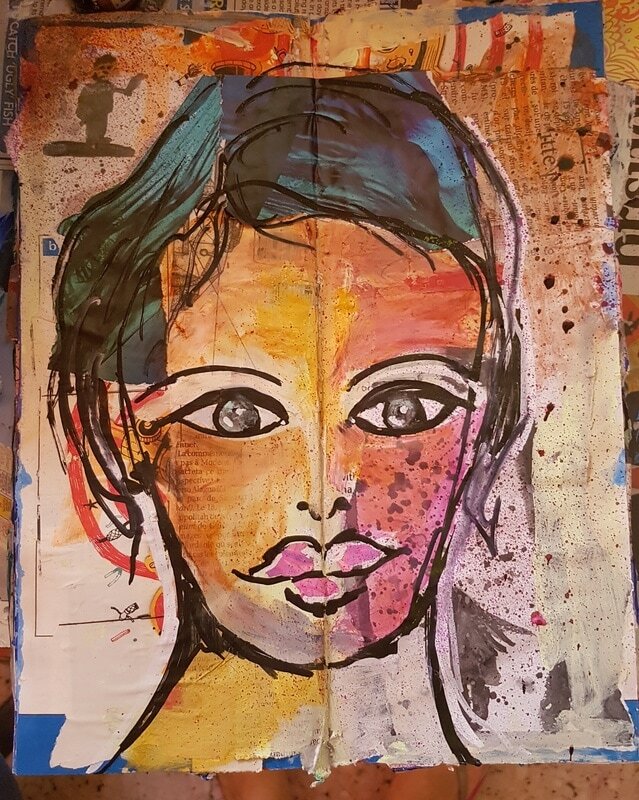 Acrylics and inks and #molotow markers, with collage for the hair and lips. This was created in my #recycled #repurposed maths workbook I'm currently working in. 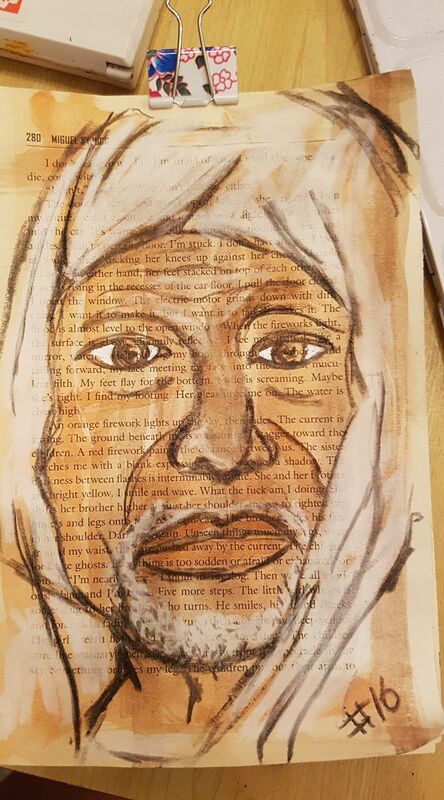 I gessoed, collaged and painted the pages first, to have them ready for the faces I create later. Face #50 of 50And here it is, face #50! Of my 50 faces #challenge.. it's over. 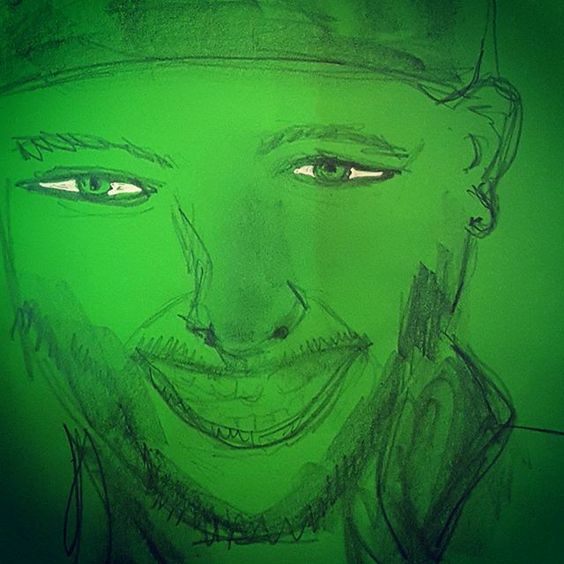 And it culminated with this face on canvas drawn live on stage at the Canadian University in Dubai Art X-Press Week. I left it as a gift to the university. In the end I made much more than 50 faces. You can see them here and on my website. I'll be adding all the other in between faces I created along the way. So what's my next challenge? Not sure yet. Watch this space to find out.